Atlantic City, NJ – The Miss America Board of Directors is pleased to announce the election of two new board members. Jennifer Vaden Barth, Miss North Carolina 1991, and Valerie Crooker Clemens, Miss Maine 1980. Both Valerie and Jennifer are long-time volunteers in the Miss America program and have most recently served as active members in the Miss America State Titleholders Association (MASTA). MASTA was established in 2015 in an effort to recognize the outstanding accomplishments of all state titleholders after they complete their year of service. 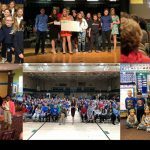 Each year, state titleholders return to their communities and use their scholarships and experiences to further their education, pursue careers, and advance their service initiatives. We welcome their insight and look forward to working together in shaping Miss America in 2018 and beyond. The Miss America Organization, a 501(c)4 non-profit organization, oversees a national network of 51 organizations, including all 50 states and the District of Columbia. Miss America contestants contribute tens of thousands of community service hours annually and have raised over $17 million for Children’s Miracle Network Hospitals and Miss America scholarships since 2007.